Wythall & District German Shepherd Training Club. Please note we don't train on Bank Holiday Weekends. The objects of the club are the furtherance of knowledge and training of German Shepherd Dogs. We aim to train you to train your dog, regardless of your dogs age or temperament. We believe in enjoying your training and getting your dogs to enjoy it too, gone are the dark days when dogs had to be pushed and yanked into submission, we prefer to use a mix of positive reinforcement alongside play and reward based techniques. 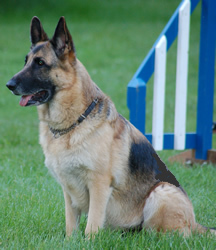 Feel free to browse our web site and see if we are the club for you and your German Shepherd. "Take this trouble for me: Make sure my shepherd dog remains a working dog, for I have struggled all my life long for that aim"
Captain Max von Stephanitz (1864-1936) Founder of the German Shepherd Dog breed.